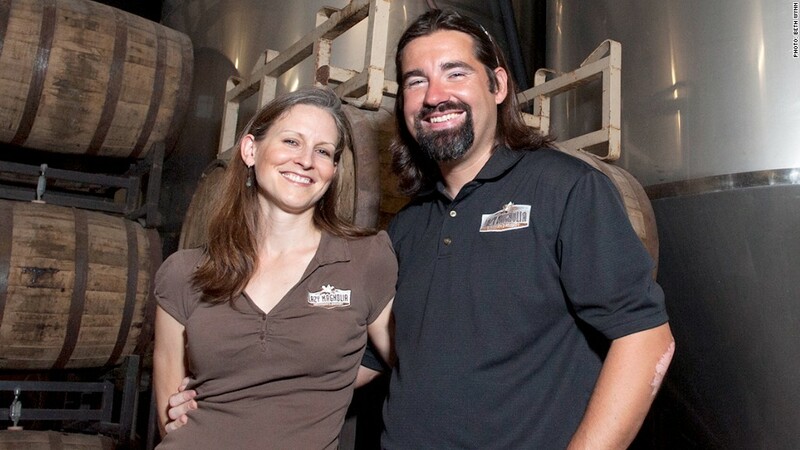 Laura and Mark Henderson opened the Lazy Magnolia brewery in 2003 -- nine years before Mississippi loosened its Prohibition-era laws. For a century, Mississippi and other Southern states had Prohibition-era laws on the books that kept alcohol-by-volume (ABV) levels so low that many craft breweries were prevented from setting up shop. When Mark Henderson and his wife Leslie founded Lazy Magnolia in 2003, it was the first brewery to open in Mississippi since 1907. And it was the state's only brewery until the laws changed nine years later. "We got started and it was all very challenging," said Henderson, who could only make and distribute beer below 6% ABV. This meant no gourmet Belgian ales, IPAs, or barrel-aged beers, which are all made with more alcohol (and are often how a brewery is judged by connoisseurs). "Our consumers expected a good brewery to have a good, showcase IPA," said Leslie Henderson. "We were fundamentally prevented from introducing the single most necessary style of beer for a craft brewery." But a few years ago, that started to change. In July 2012, Mississippi raised its ABV allotment to 10.2%. Since then, eight new breweries and one brewpub have sprung up in the state, according to the Mississippi Brewers Guild. "The law liberalized a little bit, and we saw this explosion of breweries in Mississippi," said Henderson. And Lazy Magnolia has seen business boom. It's expanded its offerings, doubled its staff from 16 to 33 employees and now distributes throughout the entire Gulf Coast. "ABV limits are not a barrier to entry into the market, but it's clearly a barrier to innovation," said Bart Watson, an economist at the Brewers Association. "The different regulatory environments in the Southeast tend to [be stacked] against small brewers. But these states are coming to recognize the [economic] value of having local brewers." North Carolina was one of the first Southern states to loosen its laws accordingly -- raising beer's ABV limit from 5% to 15% in 2005. Before then, the state had around 30 breweries. Today, there are 120, according to the North Carolina Craft Breweries Guild. "North Carolina has clearly been the most dynamic state in the South, and we're seeing a lot of production growth," said Watson, noting the state is the largest beer producer in the Southeast. Mark Doble started Aviator Brewing Company inside an airplane hangar on the outskirts of Raleigh in November 2008 with just a skeleton crew of employees. He now has 88 staffers. "I would never had considered it if the laws had not changed," Doble said. His two most popular beers -- a Belgian-style tripel and a hoppy IPA -- both have ABVs above 6%. Previously, this would have ruled out distribution to states like Mississippi and Alabama (which raised its alcohol limit in 2009). Now, Doble says the Alabama scene is "exploding" and he plans to distribute there by the end of the year. "It's still a young market compared to us," Doble said. "The next five years are the golden years because of the amount of breweries that are opening." In 2009, there was just one brewery in the Cotton State; today, there are 29, according to the Alabama Brewers Guild. This directly translates into jobs and economic stimulus. "These are high-value manufacturing jobs," said Watson. "And there are numerous service jobs that indirectly support the industry, such as agricultural jobs." Meanwhile in Mississippi, craft beer's success is evident at the Whole Foods (WFM) in Jackson, where only local beers are sold from the store's growler poles. "If there had only been one brewery in Mississippi, then they could not have done it," Mark Henderson said. "It's a lot easier to support an industry than an individual company," added Leslie.